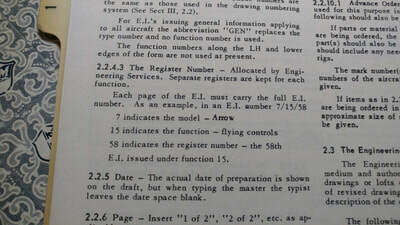 A plane ahead of it's time.. 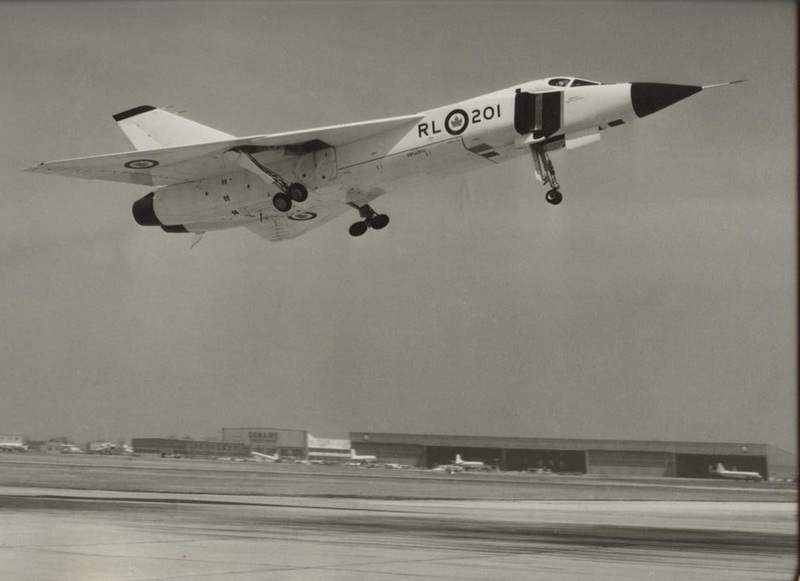 There are few Canadians who have not heard of the story of the Avro Arrow, Canada's technologically advanced fighter jet of the late fifties that was scrapped by the Conservative government of the day. 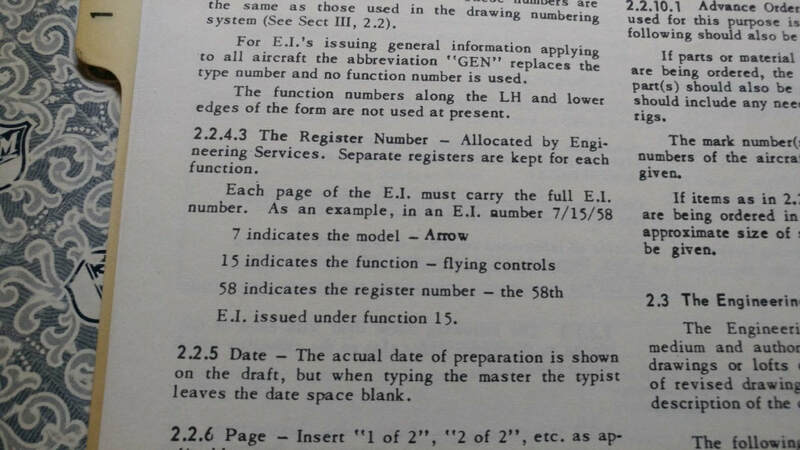 Lots of conspiracy theories abound and I love hearing from ex-Avro employees, so drop me a line at ed.das@rogers.com to share your Arrow story with me. 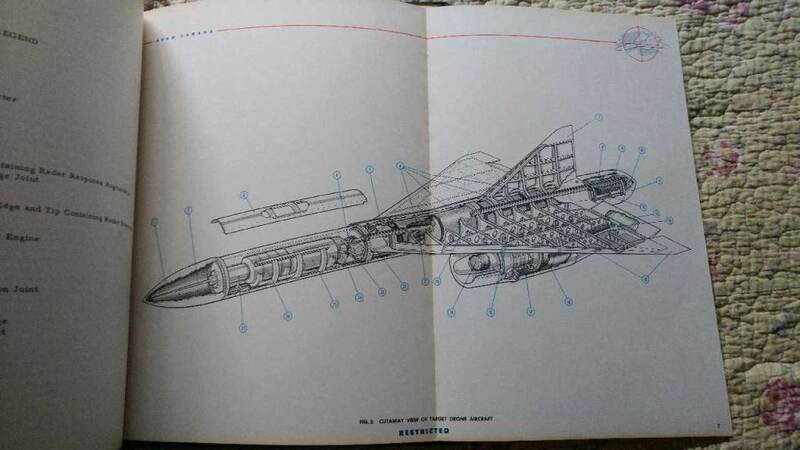 I think the Arrow is one of the coolest looking jet fighters of all time. I recently crossed paths with astronaut Chris Hadfield's dad who recounted telling me of a time when he was a young boy in Waterloo and Jan Zurakowski flew the Arrow overhead at about 5000ft turning a steep circle, seemingly around him personally and the excitement it instilled- I'm certain that this awe inspiring event for a young boy in 1957 would help to infuse his own son's passion for aviation and later a career culminating as Canada's first commander of the International Space station. 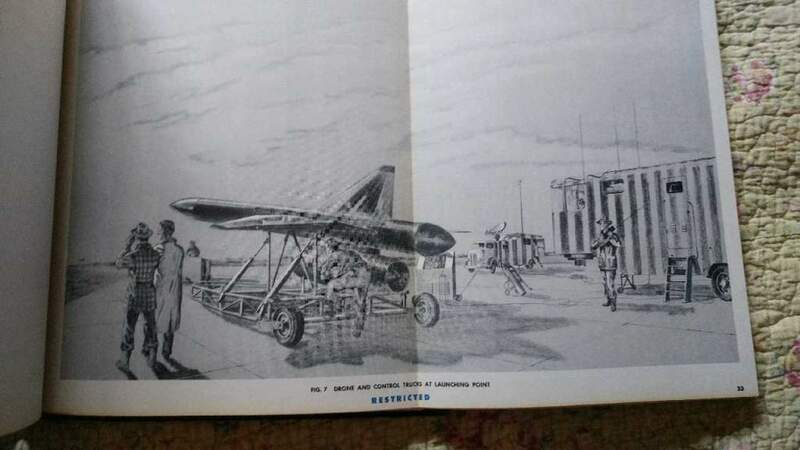 This is an original photo of the Avro Arrow I bought a number of years ago. It was produced by the promotional department of Avro (stamped on the back as such) and was likely taken somewhere over southwestern Ontario. 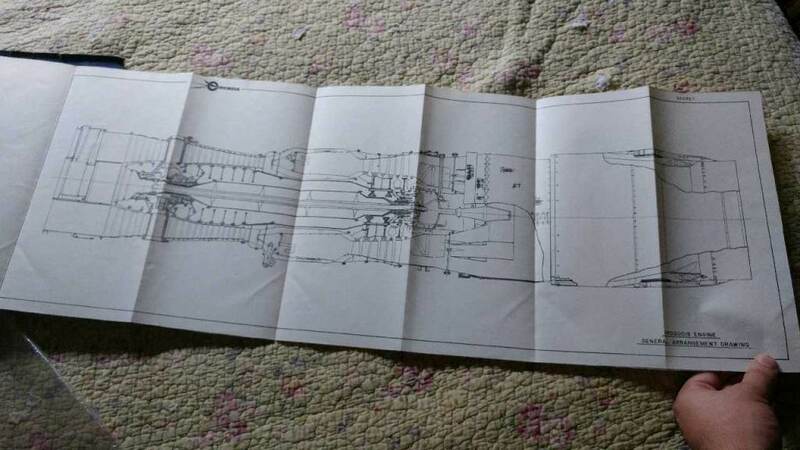 In a recent correspondence with the seat sellor, it seems likely that the famous seat is once again headed back to Canada and will eventually be on public display. I recently stumbled across this original photo( tucked away in a box) from a Stratford Ontario estate of RL201 approaching to land. Needless to say, i snapped it up right away. All that remains of the Arrow, mounted on a pedestal in Ottawa. So, in 2006 I realized the 50th anniversary of the Avro Arrow was fast approaching and that it might be a great idea to celebrate this and raise some hangar funds for my RV-4 at the same time. I drafted a design and had a graphic artist do the layout for me and then ordered 500 T-shirts from a professional sportswear company using the best quality T-shirts they sold. 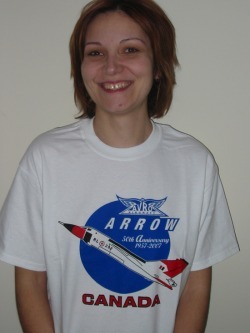 I decided that to get a headstart on the competition, I'd recognize the official rollout of the Arrow in 1957 as the anniversary rather than the 1st flight and so far, no one ever really called me out on it (although I did get one enthusiast who clearly needs a girlfriend tell me that RL-202 pictured on my shirt did not have the paint scheme I show). At any rate, the first bunch of shirts went quite quickly on ebay but then it slowed down. I think by 2008 I recouped my investment as the anniversary everyone else was marking approached, but I still had more shirts than I was confident I'd ever sell so in December of 2008 I decided I'd still make good use of the shirts by sending 100 of them to the ultra-secret Canadian airbase "Mirage" supporting the Canadian Forces in Afghanistan. Of course, donating T-shirts and shipping them to a secret location is not an easy task but with the help of the CF public relations office, I got them there before Christmas. Unfortunately, the Base Commander lost the photo with everyone wearing their Canadian Arrow T-shirt, but he did send me a photo of the entire support team in lieu of afterwards which I proudly display at home(see below). This is the photo I received from the Canadian forward operating base in Afghanistan. I'm told the T-shirts were a big hit, but due to secrecy concerns, the recipients were not allowed to send me anything but "official" photos from the base. The older I get, the more and more pieces of an original Arrow seem to pop up-here, the front windscreen on loan from the National Museumat Hamilton. 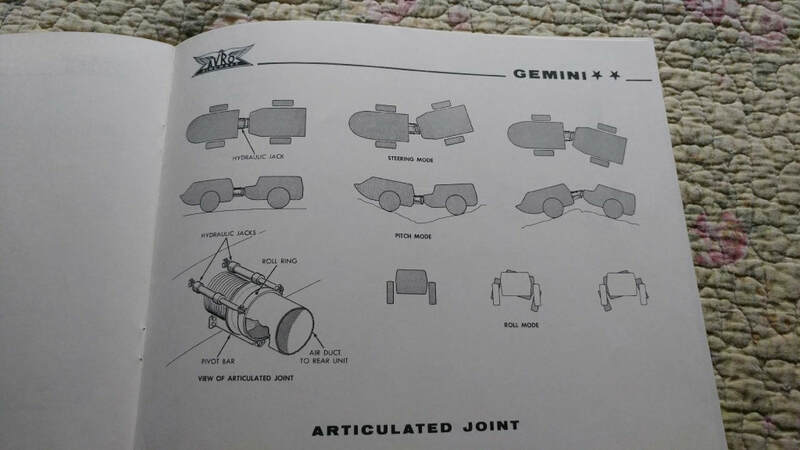 In 2002, my brother and I decided to sell our family machine shop. 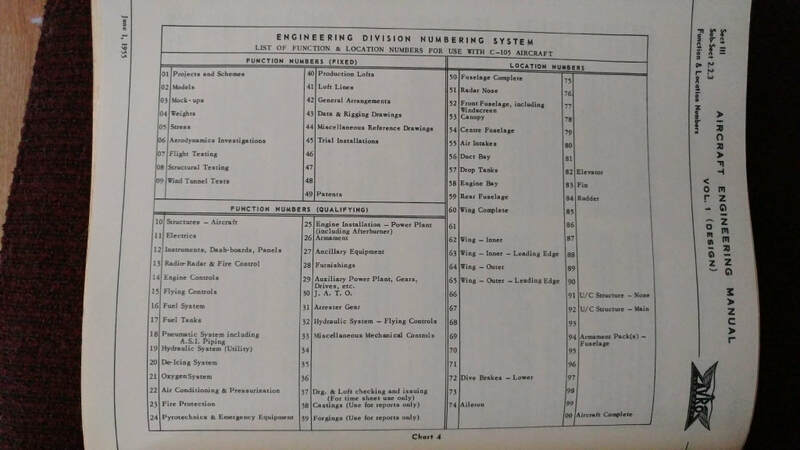 Fortuitously, another, larger machine shop in the area was more than willing to purchase at our price, and my brother and I began to make plans for what we would each do afterwards. The downside of the deal was that the new owner was run by a rather unsavory character (who would ultimately and strangely meet an untimely death by pet tiger) that my dad had always warned me not to do business with. 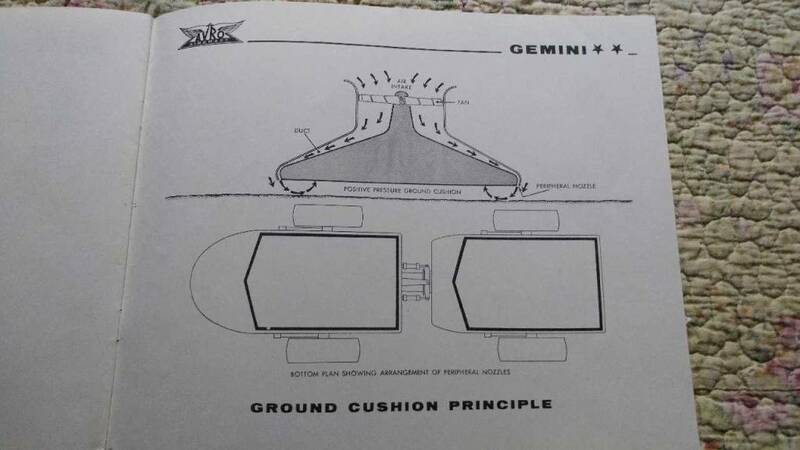 Besides our business, Mr.Big also wanted to hire both my brother and I to help expand his company- I'd never actually been professionally courted before and was flattered and impressed when he suggested that he had plans to purchase a company plane which I would of course be a logical candidate to fly. A few meetings ensued to discuss the benefits of coming to work for him, and during a tour of his plant, he presented me with a commemorative model (and VERY collectible) Avro Arrow (only 5,000 made) He'd actually given it to his right-hand man a year earlier as a gift and didn't blink an eye when he retracted the gift from said associate's desk (much to his surprise, as it was prominently displayed on it) and gave it to me as a gift. It was a very awkward moment at the time and I would probably have discreetly returned it to him at a later date were it not for the fact that the associate also turned out to be a creep too. So i have it today as a nice reminder of a plane that was always my dad's favourite, and of my good fortune that followed when I listened to my dad's advice and politely declined the job.
. I took a job shortly after my visit with Mr.Big with another company. The model sells on Ebay for $800US last time I checked. 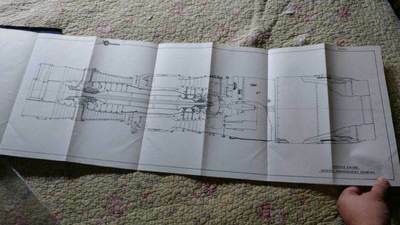 In reference to this photo off your page I hope you can assist me. My grandfather on my Dad’s side back in the 1960’s ran a company called the Greater Toronto Ceramic Center. While the test pilot was putting the Arrow through its paces the pilots wife was taking ceramic lessons from my Grandmother. 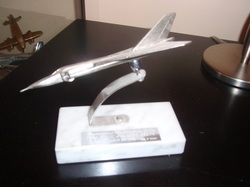 As a result of this Grandpa got the license from Avro to do kiln fired ceramic ashtrays.. However Grandpa goofed and did not keep one back for the family. While as I said I know the originals were mounted on ashtrays and this one clearly is not. 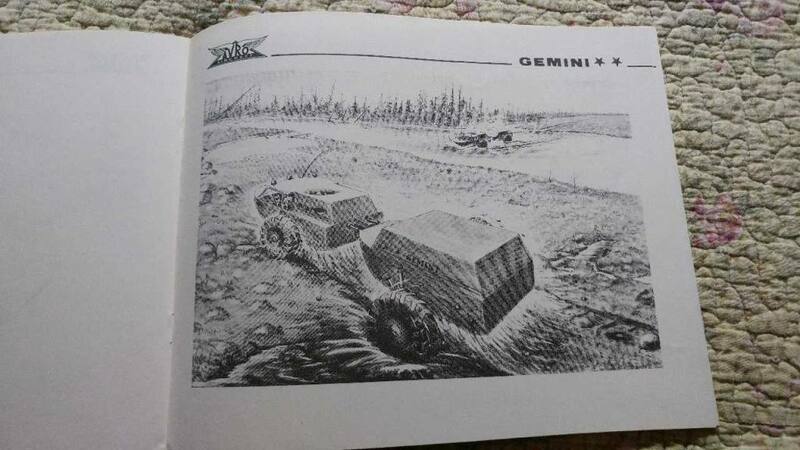 It might have been remounted in the intervening years. 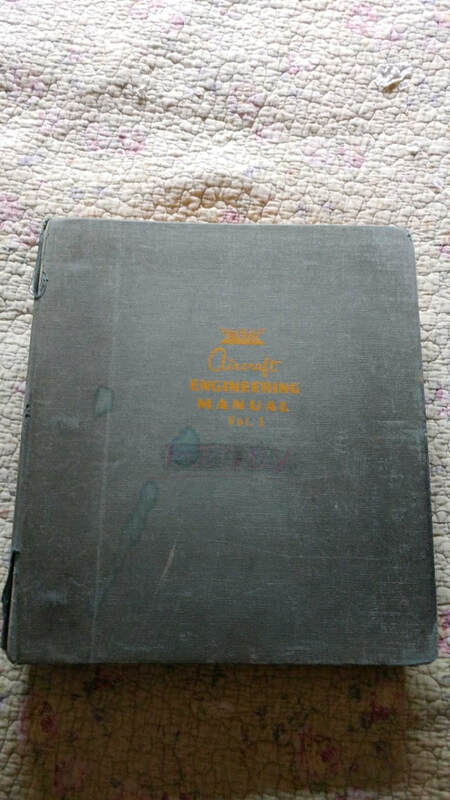 What I would appreciate is if you could look at the belly of the plane and see if the initials “CM” for Charlie Martin my grandfather or “GM” for Gwen Martin my grandmother are present. That is what will identify it as having been made by my grandparents. 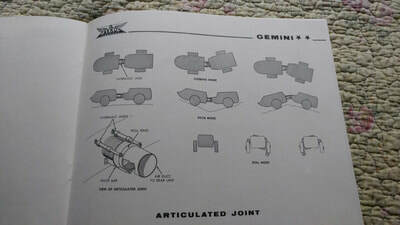 If it proves to have been made by them I would be very interested in acquiring it. 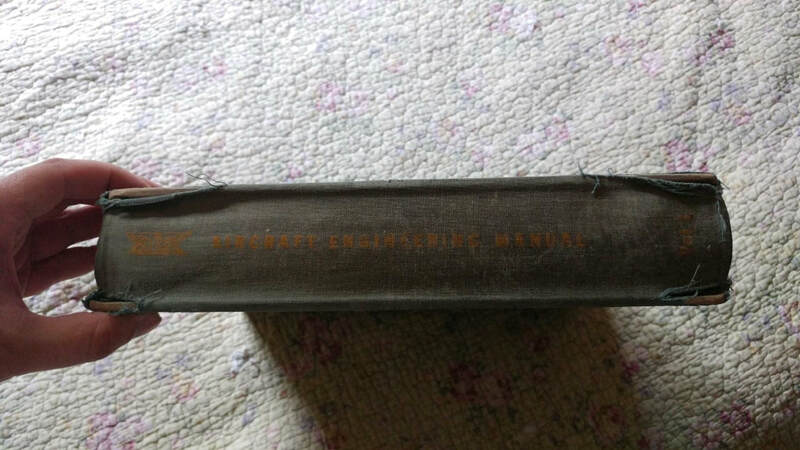 While it is a piece of Canadian aviation history more importantly to me it is a piece of family history. 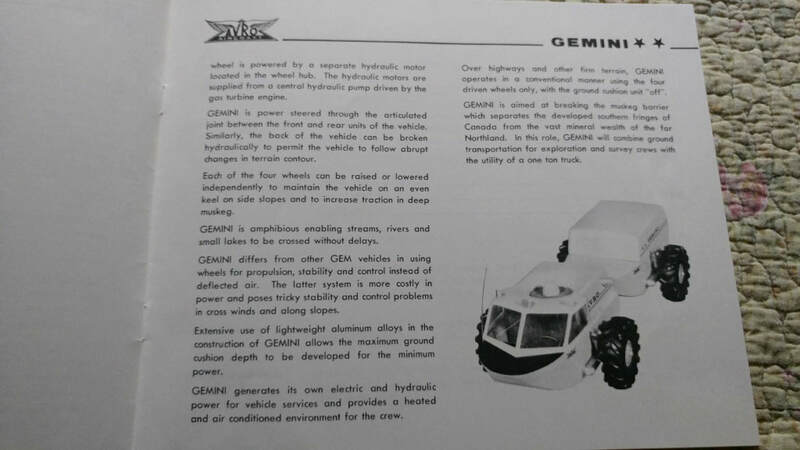 Editor's note: Anyone with info on this model can contact me and I will connect them with John. 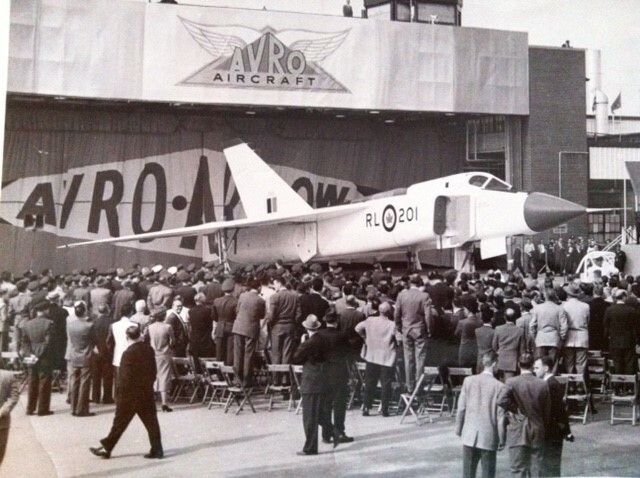 November 2018 One of the things that you'll find when researching the history of the Avro Arrow is that there is a huge community of aviation fans who are as passionate about this aircraft as a sports fan might be to their favourite team; they know all the history, the main players, triumphs and epic losses. and all crave for that just out of reach epic, win. In the case of Arrow fans it is the hope that one aircraft did escape, but in the absence of that, the consolation is to own a piece of the company history, or artifact of the aircraft in lieu of a team shirt. To that end, lots of bits and pieces actually did survive the attempted erasure of the Arrow's existence and it never ceases to amaze me how this bulk of artifacts seems to grow each year as the power of the internet connects this unique group of collectors together and bits and pieces of history gradually amass into a bigger, more complete history than was known before. 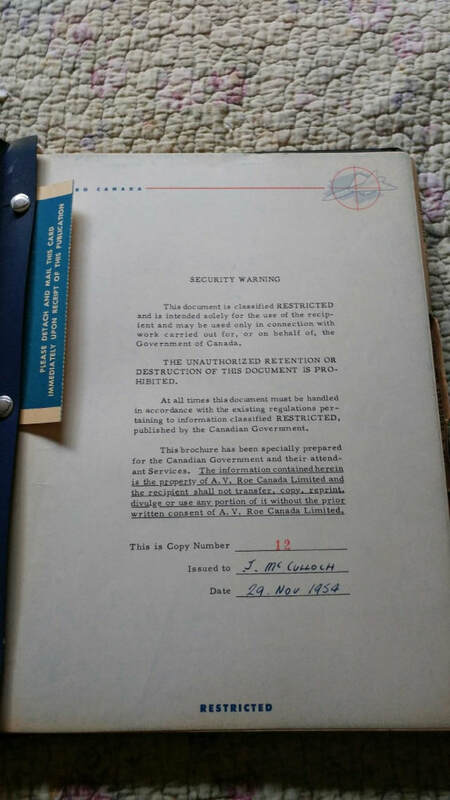 Below is a small sampling from one such collector I recently met who was kind enough to share images of a Avro collection of original documents (some even restricted at one time) he has methodically acquired over a number of years (although he is only 23). 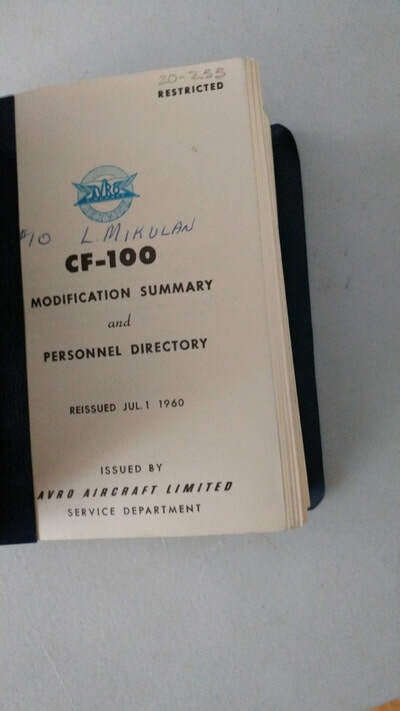 I hope treasures like these continue to be uncovered by children and relatives of former Avro employees, who stashed away whatever they could as mementoes of a incredible period of time in Canadian manufacturing and aeronautical history. 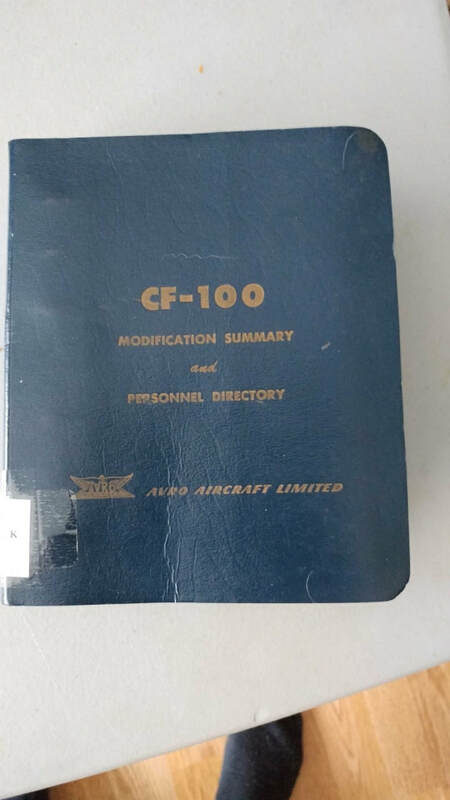 I welcome the opportunity to share these finds with other Avro fans. All of the Arrows were scrapped and sold for scrap metal when the program was cancelled but there remains many people to this day that claim one got away or was smuggled out of the factory and remains hidden away in some Raidersesque storage facility on Humber Drive in Toronto. 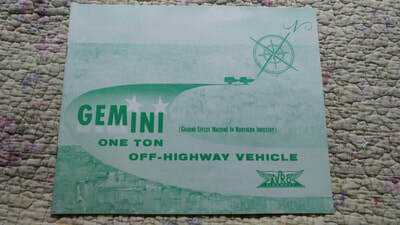 While it would be nice to believe that, nothing but a handful of parts have ever resurfaced and the current conspiracy theorists who claim it is hidden in a Toronto warehouse are simply out to lunch-I visited the site in person (inside and out) and there is nothing there but a cross-dock shipping operation by a local trucking company. I hope to be proven overly skeptical someday, but for now, I can safely state that one unfortunately did not get away. There does remain numerous artifacts collected by enthusisasts over the years, presumably taken by workers as mementos in the dying days of the program- I recall one museum curator telling me about an elderly man who had loaded up Arrow jigs from the assembly line and taken them away with his pickup- he still has them tucked away in his garage in North Bay but the museum could not afford his asking price when approached by him. 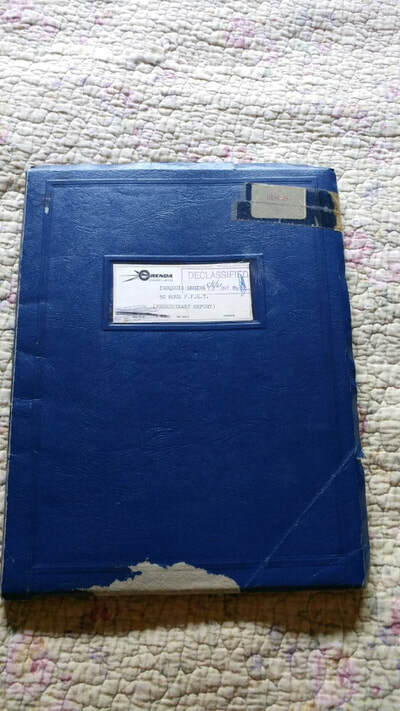 As a technical sales representative for machine shops in the GTA, I have meet numerous people in the industry who all tell stories of a tunnel system that once connected the AV Roe plant with the Orenda Engine plant a few kilometres away. 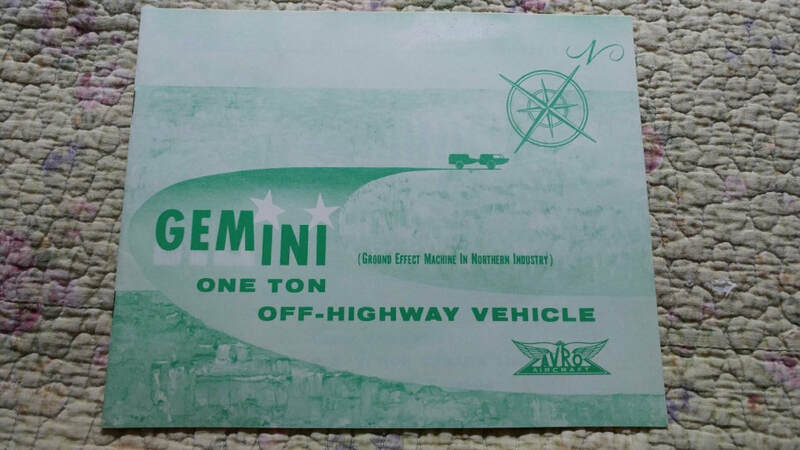 One current employee tells me it was built for employees during the Cold War to travel back and forth between facilities-perhaps big enough to smuggle large aircraft parts through?. Another recounts having had the key to the access door of this tunnel at the rear of the plant as late as 2002-it would have taken some significant ventilation to move enough air between the two plants but there does exist some rather large ventilation towers at the rear of the plant which presumably would have been big enough for this purpose-hopefully, someone will catalog what remains of the Cold War structure before it's imminent demise when the as yet un-named buyer takes over the plant early in 2019. 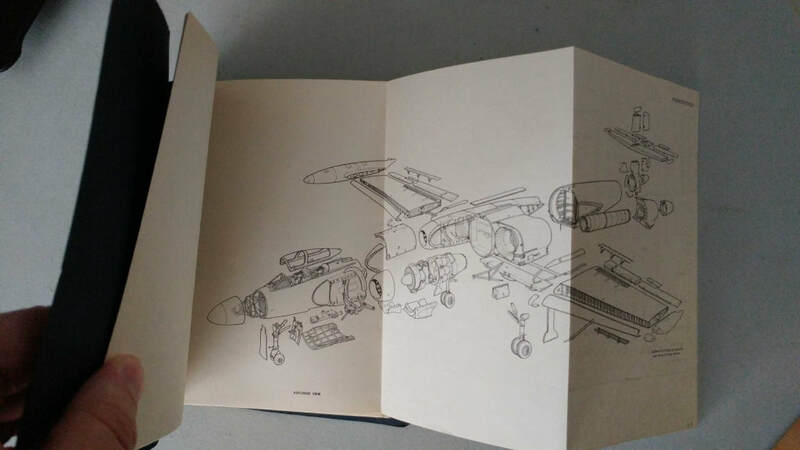 No, it's not a secret government hangar (but wouldn't it be cool? 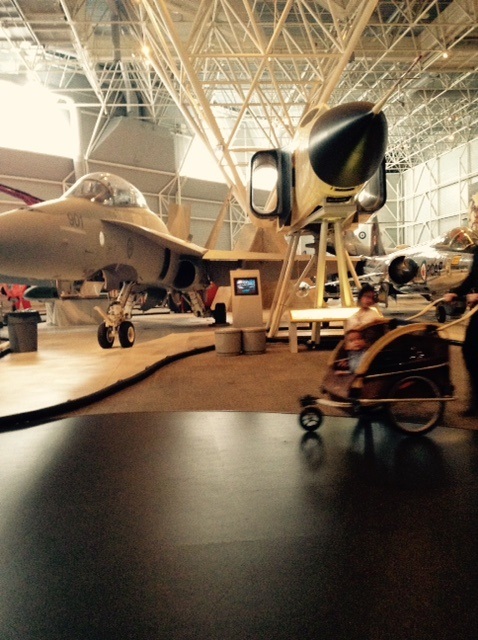 )-just a replica done very nicely and housed at the Canadian Air and Space museum in Downsview. (as of May 2015, now parked in an Air Canada hangar) Update Sept 2017-parked on tarmac on north side of Pearson. 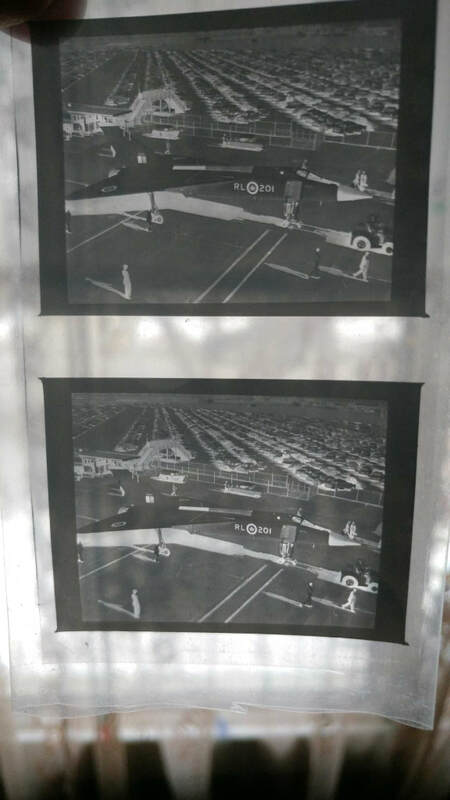 You can find some really cheap, collectible stuff on Ebay-I picked up this original photo of the prototype CF-100 Mark 1 fighter by Avro , a Canadian fighter that was, unlike the Arrow, quite successful with almost 700 planes built. The paint scheme on the prototype was all-black, with white lightning stripes down the sides- although it wasn't that fast. One did go supersonic once in a dive but that was probably about as good an idea as aerobatics in my RV-4. 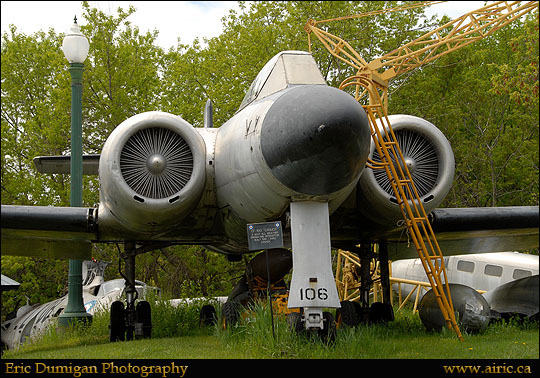 Surprisingly, I recently learned that one of the original prototype CF-100's crashed not far from my home in Strathroy. According to the Strathroy Historical Museum," On April 5, 1951 a twin-engine Avro CF-100 jet crashed and exploded four miles east of Mt. 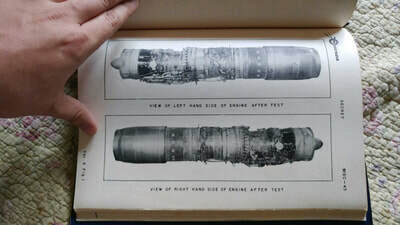 Brydges, killing both the pilot, F/Lt. 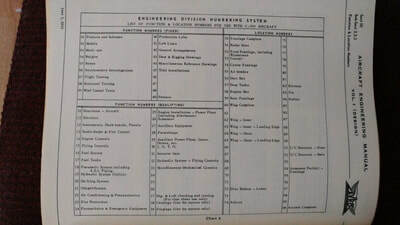 Bruce Warren and Robert Ostrander, an engineering observer. 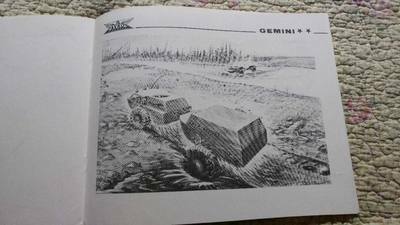 It left a crater 30 feet long, 15 feet wide and more than 12 feet deep. The force of the explosion was felt more than five miles from the crash and wreckage was spread over an area half a mile square. 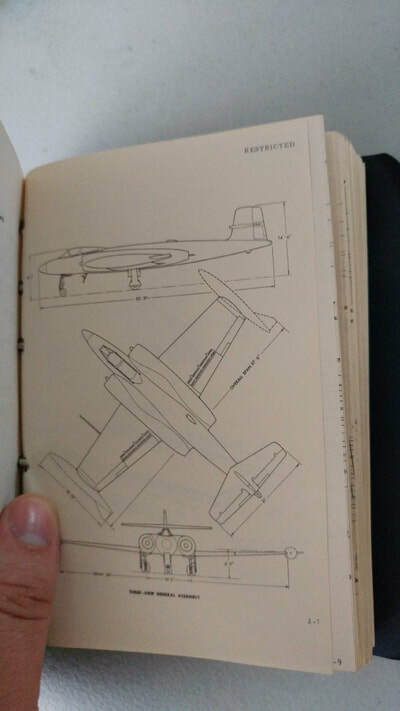 The plane was a prototype built by A.V. 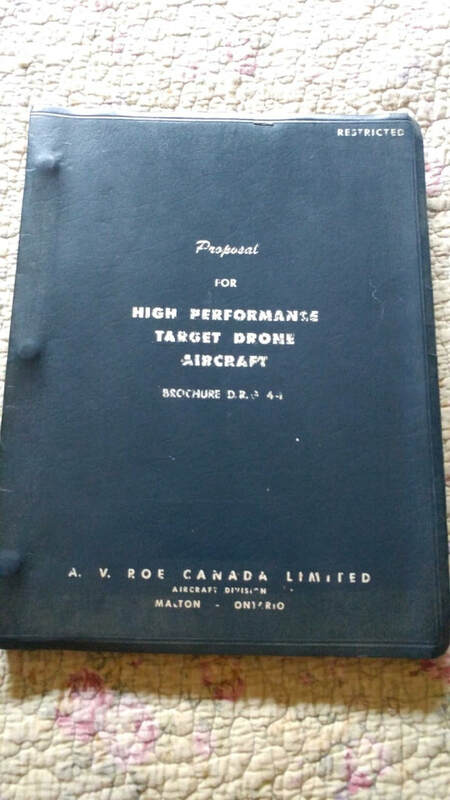 Roe Canada for the RCAF. On this morning, it was on a routine test flight when something went terribly wrong. Since it was a top-secret model, nearly 50 RCAF and Avro personnel kept visitors away from the crash site. Investigators eventually reported that the probable cause of the tragedy was the failure of the pilot’s oxygen supply system. The lack of oxygen caused him to pass out and lose control. A piece of the plane was shown at the SDHS show and tell meeting in January 2016." 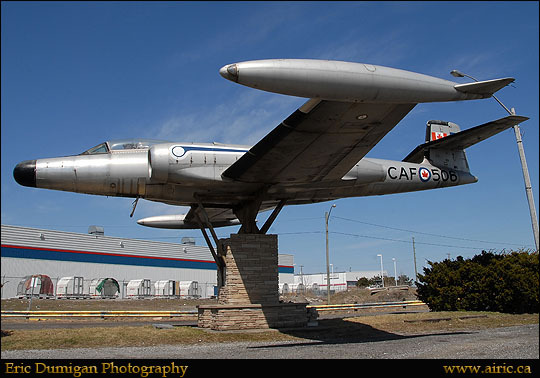 This is an CF-100 that used to sit outside of a Canadian Legion close to my old home by Strathroy somewhere outside of Lambeth. Anyhow, it was removed several years ago for a retrofit to restore it to it's former glory for museum display but I don't know whatever happened to it-maybe someone can let me know. This photo was taken in the late nineties before it was moved. Update- it's now sitting outside at the Campbellford Museum and not being restored. Too bad. 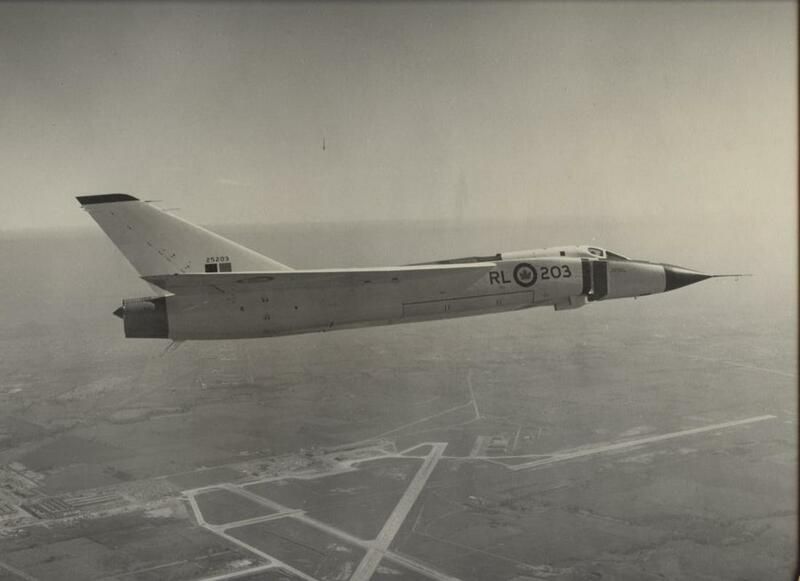 is the oldest CF-100 and is a Mk.2T outfitted with dual controls. Harold Carlaw ran the Campbellford museum for many years but has unfortunately passed away -his son now owns the collection.Hopefully, one day this historic aircraft will be placed indoors. 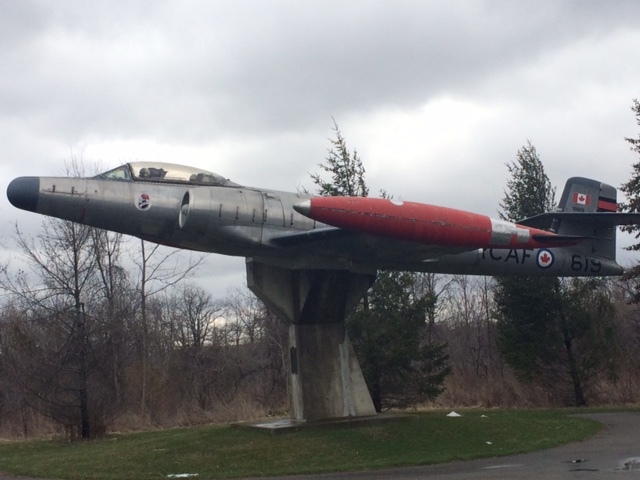 I stumbled across this CF-100 at the Hamilton Warplane museum recently but am not sure if it's the same one that sat at the legion above-anyone know for sure? Update Oct 2013: Eric Dumigan also solved this one for me. It is the same aircraft that was once at Central Technical School in Toronto. It was sold to the Legion at Hamilton and was on a post for many years until it was taken down a few years ago. It is now owned by Al Rubin and is stored outside at the Markham airport on Hwy 48 along with many other ex-caf airframes. Photo below reproduced with permission by Eric Dumigan. CAF 506 before it came down from it's post. Hopefully, some of these jets will one day make it indoors where they can be preserved for the long haul. 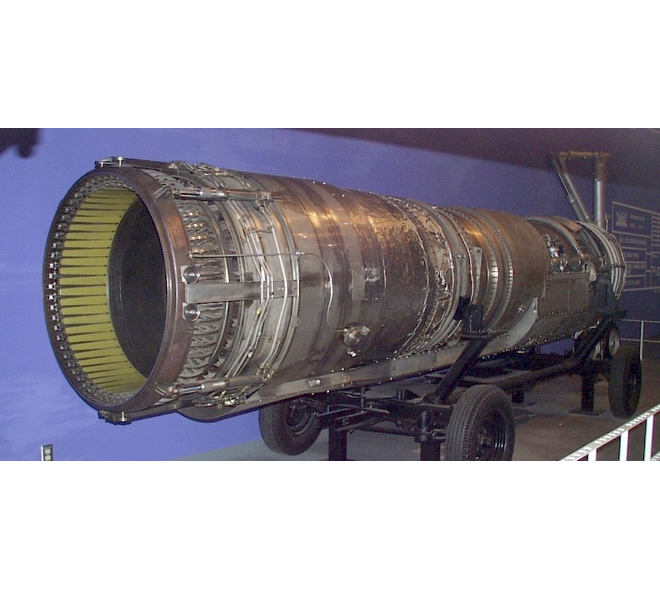 This jet engine has been perhaps overshadowed by the development of the Arrow however, the Orenda engine was in it's time one of the finest jet engines produced, most significantly for the F-86 Sabre. 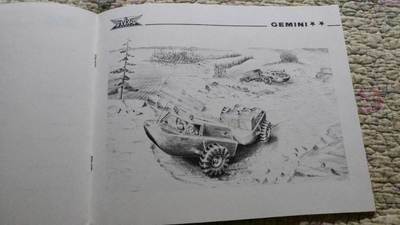 It was so good, the American military briefly considered producing a version of it themselves. Orenda engines also powered the F-100. 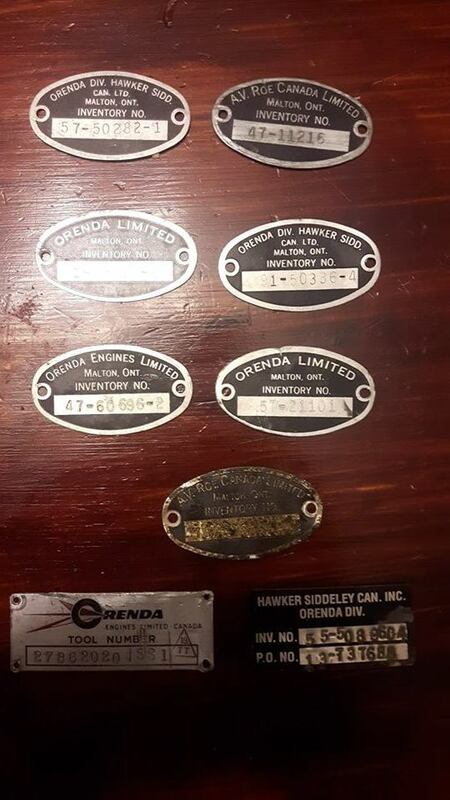 The original Orenda plant still exists on Derry Road in Toronto a few kilometres down the way from Pearson airport. I'm told by employees that the building was constructed with bomb proof roof, reinforced like crazy walls and super reinforced concrete floors all designed to protect the company during the Cold War era and the perceived threat of the Russians at the time. Many rumours persist to this day about underground tunnels and complex built to transfer engines and parts between the Orenda plant and the AV Roe plant at Pearson (and later Boeing). 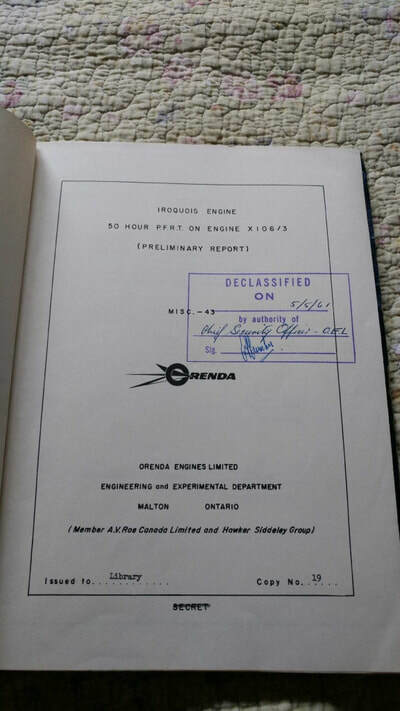 One of my customers who worked at Orenda as late as 2002 even recounted discovering a door that led to an underground tunnel at the rear of the plant-unfortunately the original building has recently been purchased by an as yet un-named buyer. 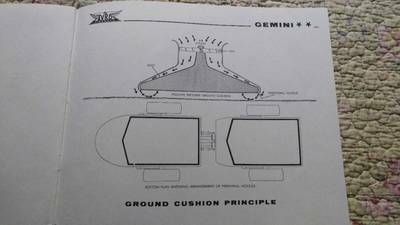 Part of the terms of the sale is to build Orenda a new facility they can move into- conspiracy theorists will have a heyday with the fact that the new plant is only about 100 metres east of the original plant on the same property. 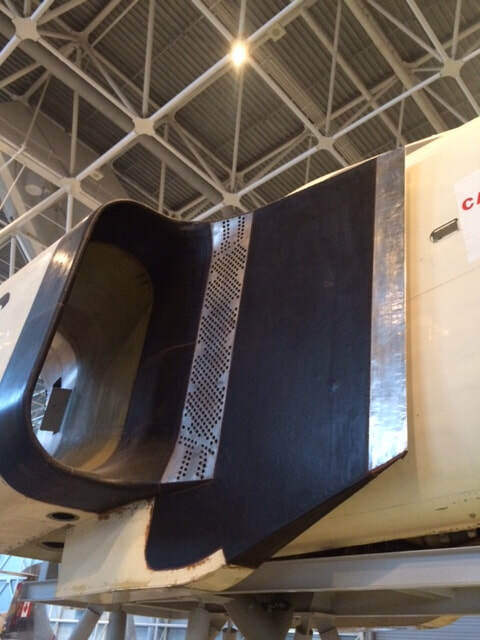 This is the Snecma engine that powered the Concorde. 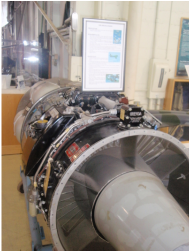 I've been told that this engine was a copy of the Iroquois engine from the Avro Arrow. 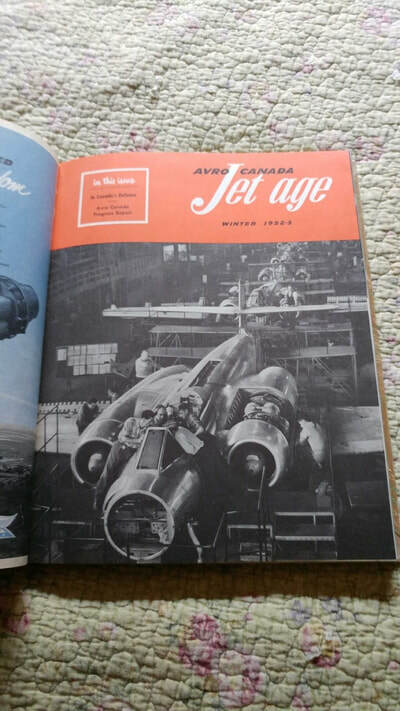 Many of Canada's Avro engineers went to work for the American space program after the Arrow's cancellation, including apparently help with the X-15 rocket plane. 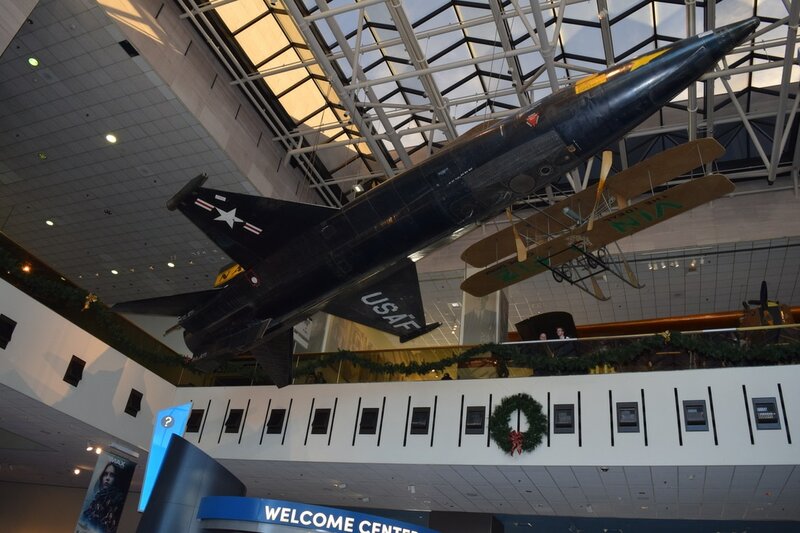 The X-15 as it appears today in the Smithsonian main atrium.